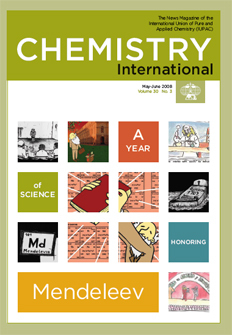 Cover: This collage includes drawings extracted from the three prize winning entries in the Spanish Royal Society of Chemistry’s (Real Sociedad Española de Química) competition for high school and college students for the best comic about Mendeleev’s life. The artists are as follows: Sergi Segura Font (black and white comic entitled Dimitri Mendeleyev), Aysha Zreika for Vida y Obra de Dimitri Mendeleyev (first row, second square to the left and the four central squares, and the two on this page above), and María de la Cueva León Merino for her comic Mendeléiev (1834-1907) (top and bottom right square). Page last modified 4 June 2008.